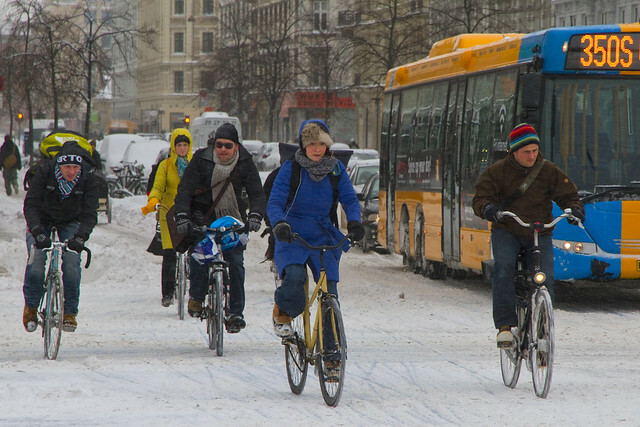 A blizzard rolled in over Copenhagen on the 23rd of December, with hefty winds to boot. It was the nation's busiest travel day and the last shopping day before christmas. The snowploughs and sweepers were out in force - respect! 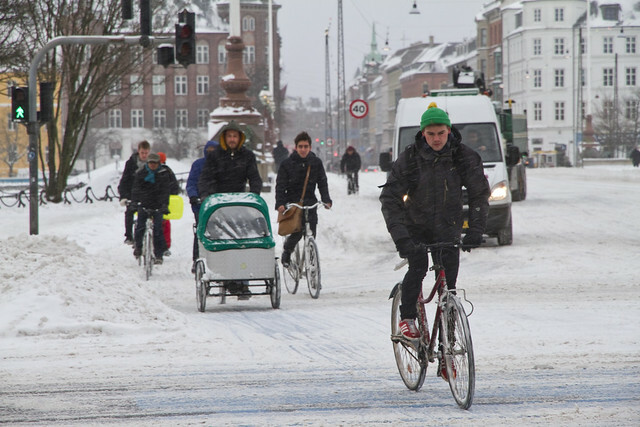 Copenhagen was more empty than normal - many people travelled early to get to where they needed to be for christmas on the 24th - but there were still loads of bicycles in motion. The bike lanes on the main arteries were cleared but the snow was one step ahead so there were stretches that were completely snow-free. 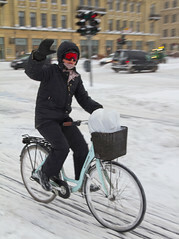 Add to that snow drifts from the winds and it was certainly more interesting than normal to cycle around. Cyclists were smiling and chatting to each other. A rare mood of solidarity in the blizzard. It was lovely. Three people asked me how the Bullitt was in the snow and I have to say - as I did to them - that it is absolutely brilliant in the snow. I won't ride anything else in weather like this. 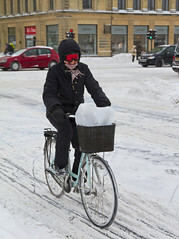 The low centre of gravity and the front wheel far out front lets me roll right through snow and snowdrifts alike. It is incredibly stable. There are slip-sliding moments and fishtailing but it is so stable that it hardly affects the riding or trajectory. 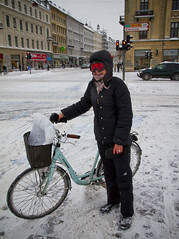 While most people on bicycles were dressed in the same clothes that they would walk in, I chatted with this lady with ski goggles. She was loving it in the blizzard. Many people were taking a shortcut across The Lakes. Impossible to ride out there, but they merely pushed their bikes. What an Arctic scene. Here are all the photos I took on the 23rd during the storm. Citizen Cyclists on their bicycles in the City of Cyclists.